The Wheeling Freight Terminal has monthly operating sessions. A message is sent to several interested modelers and operators in the area about a week beforehand. I’ve typically been operating on the fourth Thursday of the month and a layout in nearby Las Cruces hosts a session on the second Thursday. August was busy for the usual crew and only Robbie was able to attend the recent session. The layout is usually operated by a pair of two-man crews. One crew works the team yard and the other works the freight house. Since there were just the two of us, we decided to each work as a crew to sort the incoming freight cars then work as a two-man crew to pull and spot cars at the team yard. Robbie is a regular operator and we worked smoothly, wrapping up the team yard in a couple of hours. After lunch, we lined up the cars for the freight house and completed the tasks in another couple of hours. 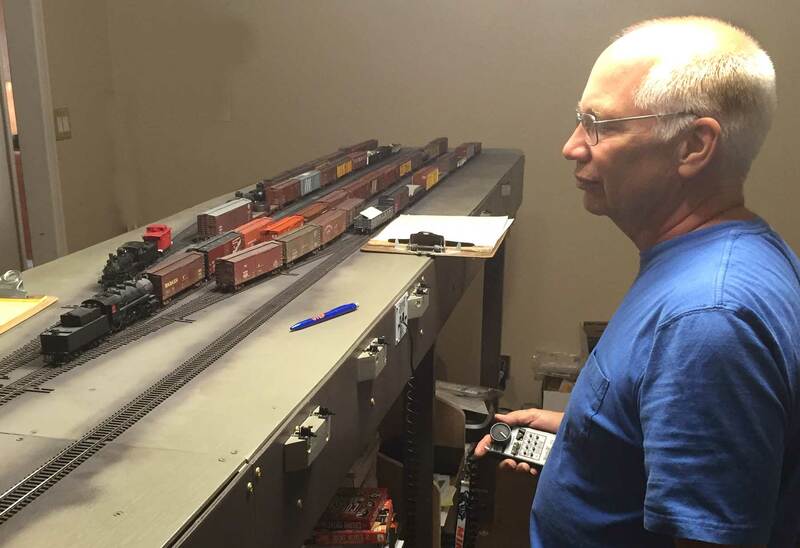 We moved nearly all of the 98 freight cars on the layout during the session. Robbie had to head home so the outbound cars were left in the yard. I’ll probably classify them for the six outbound destination over the next few days. I was about to shut the layout down when the cars in the team yard caught my eye. I realized they were all proper models for the 1926 setting. I don’t recall seeing the team yard filled with freight cars that all fit my modeling era. Sure, a few remain unpainted but they all reflect prototypes that were among the 1926 railroad fleets. This railroad is starting to appear like I want it to be. Congrats: it’s great to see the layout coming together as you envision it. Getting enough rolling stock of the correct era and road name mix is a real milestone. That sounds like a really fun day. Seeing the freight equipment all starting to come together is a real boost to the modeling vision. It’s a validation that you’ve got your plan well in hand. Congratulations! Hi Eric, looking really great! I get a good sense of the flavour of the era. It appears by the photo that the team tracks have dedicated spots or areas for specific types of cars. Is this true or a co-incidence? In your lead photo I see a caboose, are they generally handled as part of ops, that is, being removed from the train in the yard and replaced when re-classified for outbound movement? If so, is there a caboose track? Thanks for your comment, Rick! When we began operating, I thought there should be a couple of places for specific cars to unload in the team yard. The valuation map noted the very short track that extends off the ladder as an auto track, so automobile box cars are usually spotted there. Reefers are typically spotted at the end of track three, which is in the upper right corner of the photo. Tank cars are spotted at the end of track two. There is a coal spot on the ladder where the hoppers are located, and there are three dock spots along the ladder for an industry. An enjoyable read more please. I’ve had moments like that also. I model the year 1929, only three years off from Eric’s. I have a PRR coal drag of about 60 cars. Initially, most of the cars has the PRR Ball-Keystone monogram, which did not come into use until 1930 or 1931 on hopper cars. Over time, I’ve been repainting and/or relettering hoppers into their earlier schemes. As fewer and fewer cars in the string have Ball-Keystone monograms, it looks more and more like my desired era. Eric I know that feeling well, when things just turn up ‘right’. I often find it when I’m putting together a train of select cars for photos, and putting them in a new scene – but sometimes you’ll just happen on something unintentional that just grabs you. It’s a great feeling.